The numbers show the the total amount of electricity (in thousand megawatthours) produced by wind by state based on data from the EIA for 2016. Oil rich Texas is also by far the US leader in wind energy generation accounting for just 25% of total US production. 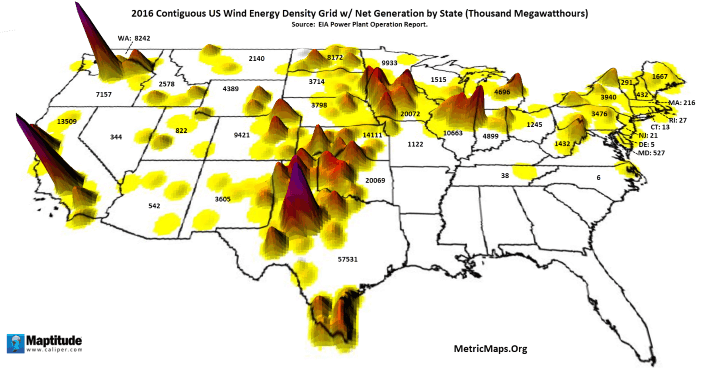 Other major generators include Iowa, Oklahoma, Kansas and California. In total, 41 States produce at least some of their electricity from wind, which leaves only 9 states (all Southern) who don’t.